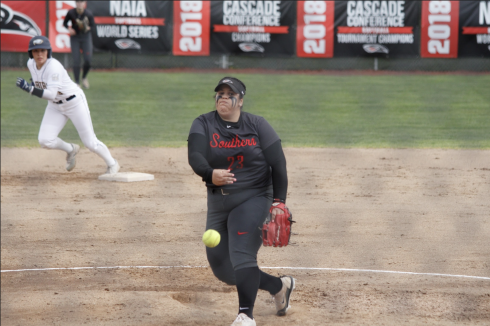 A shutout performance by Jordyn Kurtz and a pair of solo home runs by Rayna Okimoto and Irene Barrantes helped the Southern Oregon softball team to a sweep of 11th-ranked Concordia on March 22 in Portland. The Raiders won the opening game 1-to-0 and won the nightcap 4-to-2. The Raiders are now 5-8 overall and 2-0 in Cascade Conference play. Southern Oregon travels to Eastern Oregon on Friday and College of Idaho on Saturday. Concordia, the preseason favorite, dropped to 7-9 overall and 0-4 in conference play. 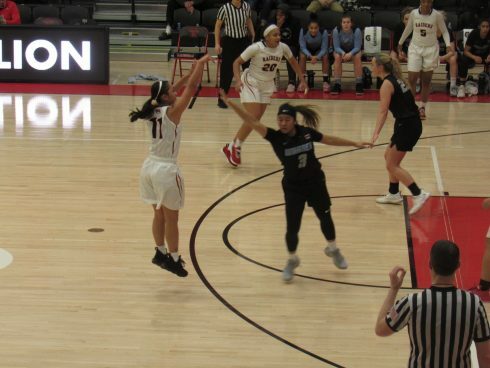 In the opener, Kurtz returned to the form that earned her All-Cascade Conference honors two years ago as a freshman. The junior, who entered the doubleheader with an 0-3 record and a 6.30 ERA, never let the Concordia offense get going. Kurtz scattered five hits over her seven innings of work, struck out three and forced 12 ground ball outs. The SOU offense finally got on the board in the top of the third, taking advantage of three errors to take a 1-to-0 lead on a sac fly by junior, Katie Moy. The one run would hold over the final four and a half innings. Kurtz also led the SOU offense in the opener, coming away with a pair of base hits. In the second game, singles by Melissa Corn, Karri Johnson and Kurtz helped the Raiders take a 2-to-0 lead in the top of the first. In the bottom of the first, the Cavaliers roughed up Johnson, SOU’s starter, for a pair of runs and chased the senior from the game with just one out in the first. Freshman Karlie Stephens came in for the Raiders and retired the next two batters and the two teams were tied at 2-2 after the first inning. Stephens did her part, keeping the Cavaliers off the scoreboard and Okimoto put the Raiders up 3-to-2 with a solo home run in the fifth inning to straight-away centerfield. In the sixth, Barrantes came off the bench to lead off the inning with a blast over the wall in right for a 4-to-2 lead. The lead would hold as Stephens finished out the game for the victory. Stephens is now 3-0 on the season and lowered her ERA to a team-best 2.58. Gia Dimaggio led the SOU offense in the second game with a 3-for-3 effort. Okimoto had a pair of hits for the Raiders. Okimoto now has six home runs on the season, which ranks tied for fifth all-time at SOU.